List of good colleges in Pune for automobile engineering? How much is the salary of automobile engineer? Where should I join to do Automobile Designing course being an Automobile Diploma Engineer? Last date of sale of application form for B.Ed? How to join ISRO if I am a Automobile engineer? What is the scope of getting placement in Automobile Engineering? How to become a automobile engineer after passing B.Tech? How to become a good automobile engineer? What is the difference between automobile engineering and automobile designing? Can I get placed in abroad after finishing my automobile engineering in Bangalore? What is the average salary of an Automobile Engineer? Job in Abroad for Automobile engineer having 10 years of experience? Re: How to become an Automobile engineer after finishing 10th? You should take Science Stream with Chemistry , Physics and Maths as your main subjects in class 11th and 12th. 12th from recognized board With Chemistry , Physics and Maths as main subjects. 50% to 60% marks in your class 12th. choose B.tech in Mechanical Engineering or Automobile Engineering . There will be a change in coming session in Entrance Examinations like IIT-JEE and AIEEE would be combined as ISEET examination. In Automobile Industry lot of Mechanical Engineers are recruited as Automobile Engineers after giving them extensive training. can also work as Automobile Engineers as the Industry need other discipline Engineers also but most prefered discipline is Mechaical Engineering . If you want to make your career in Automobile Engineering, then you will have to pursue your degree in Automobile Engineering from an Engineering College. For this, you must take Physics, Chemistry and Mathematics as your subjects in Class 11 and 12. If you want that your future should be bright, then you must do this UG course from a good college like IITs, NITs, Deemed Universities, etc. For admission to these colleges, you will have to crack IIT-JEE, AIEEE, etc. exams which are gateway to these colleges. To be eligible for these exams, you will have to secure at least 60% or above marks in 10+2, then only you will be able to appear in these exams. fiorst of all you must do 12th class to become eligible to take admission in b.tech in automobile engineering. you must take non medical in 12th class. after completing 12th class you will have to give an entrance exam of aieee or iit jee. if you get good marks in any one of these exams, then only you will get admission in b.tech in automobile engineer. -->For this first you must have to do 12th class with PCM subjects. -->then you also need to give the entrance exam AIEEE. -->based on the AIEEE rank and marks you will get the college. -->there are the govt. colleges which offer courses in B.tech,M.tech and many others. -->if anybody wishes to get admission in any of the NIt'S across the countery,then they should apply for AIEEE. -->SO,AIEEE plays very important and vital role. -->my dear friend work hard and attain good rank in AIEEE to get admission in one of the best institute. all the best....go ahead and work hard!! Sir i have finished class 10th and i want to be an automobile engineer but i want to do my college out of india.so which college should i look for better education in my field? I am now in 10th standard and am interested in doing automobile enginneering abroad. After 10th nothing is possible for the field of engineering because to do engineering in any of the field you have to first complete your 12th with non-medical stream then after you can go for engineering. >>And after completion of 12th with more than 60% marks then after you can apply for AIEEE i.e.All India Engineering Entrance Exam .On the basis of rank in AIEEE you can apply for automobile engineering. -->>You should be 10+2/Intermediate pass out from recognized university/Board. -->>Your subject stream should be Science with Physics,Chemistry and Mathematics. -->>Your minimum marks in 10+2 should be above 60%. -->>JEE Mains - In order to get Admission in Engineering colleges. IMPORTANT :- After passing in the JEE Mains exams you will also be eligible to appear in the JEE Advanced in order to get Admission in IIT's Colleges. NOTE :- In order to appear in JEE Advanced Exam,Your Rank in JEE Mains should be under 1,50,000. 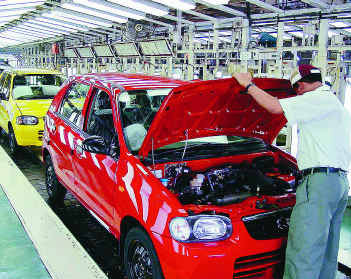 To become an Automobile Engineer after 10th, you can persue diploma in mechanical or automobile branh. After the completion of diploma you may go for B.E/B.Tech or the job. Another one option is that, first finish your 12th board examinations and then go for various Engineering entrance examinations like IIT-JEE/AIEE/WB-JEE etc. Otherwise, you can directly get admission in some private Engineering colleges by paying direct donation and fees. If you crack Engg. entrance exams that will be better for you. After passing 10th if you want to do automobile engineering you have to pass 12th class with minimum 60% marks with Physics chemistry and Maths stream. Your rank should be in top list. I want to do mechanical engineering .What should I choose ...IP or CS for a better career ahead? What are the branches i have to study to get iit after 10! After cracking IIT .Is there is any scope for government job related to engineering? We want the all details of Automobile Engineering in Gujarati? Can you do it? WHAT ARE THE STEPS TO BECOME A AUTOMOBILE ENGINEER ? how can i Become a Automobile Engineer...?? l am the student from Nepal. l want to apply for automobile for diploma course what should I do for that? i m now in 12th but im giving PC and psycology not maths. So there's any chance for me to give engineering exam i mean JEE Exam? It is good that you have decided upon of what you want to be in the future well in advance. Now only thing that is required is to know the road map to reach your destination. I am here to provide you the same. Try to complete it successfully. The minimum percentage of marks required in 12th class for the candidates to apply for Automobile Engineering will be 60%. So, try to secure 60% percentage of marks in 12th class. The admission for Automobile Engineering course will be given on the basis of performance in the Entrance Exam. So, choose one Entrance Exam and carry your preparation for that Exam along with your academics. Try to be good enough in completion of syllabus for the Entrance Exam by the time you complete your 12th class. In addition to that, collect previous year and model question papers for that Entrance Exam and practice them also. After you have finished class 12 you must go to a qualified engineering institute .if you obtain 50 to 60% marks you will get job offers from india as well as abroad. What to do to become an automobile engineer after finishing 10th standard? i have complited my 12th and my percentage is 58, so what can i do for automobile engineering? How to become an MD for one of the best and top company in the world? So i want to ask that is there any other way to become an automobile engineer....??? Or i should repeat my class 11 and study harder to score better..??? Automobile is a very good and growing sector of mechanic field today,s new and new models of new cars and motors are coming in market that is the product of Automobile engineering so there is a boom in this sector and also our youth is attracting towards it now and why should not attract towards it as it is also offering a high salaried jobs in our country and also in foreign to our engineers and a vast demands in foreign countries is also of Indian engineers. To become an automobile engineering you are free to choose either mechanical or automobile engineering if you choose mechanical then you can also join this sector and if interested in proper field then you can do Master course in M.tech specialization. After qualifying these exams you can apply for online counselling all india collages and then on bases of rank you can get a seat in any collage and can complete your dream. I have given my 10 boards now and as a career option , I want to become a car designer ?What do I need to do next ? Take an admission in Science for 11th. Score good marks in your 12th Exam , write the CET Exam and then all the way into your Automation Engineering Exam. Well friend as you have completed your 10th at present then you can become automobile engineer in two ways. After 10th you can appear for polytechnic exam and after clearing that you can take automobile as your specialization and then become an automobile engineer. Another is that you complete your 12th with physics,chemistry and mathematics and appear for engineering exams and take admission in automobile engineering stream and get your goal achieved. Join your 11th. Take up sciences with physics,chemistry and mathematics as your core subject. Get good marks in your 12th passing out exam. Next step would be to write entrance exams like AIEEE, IIT-JEE, COMEDK, or common entrance exams according to your state. If you get great ranking then you are eligible to choose the college you want for automobile engineering. You will have to go through counselling. And that's it. You are in engineering class. You need to give alot of entrance exams for engineering you should choose your subject as MPC in 11th then take btech in automobile engeneering course based on IIT . Hope your gonna join soon. Which is the best way to do automobile engineering??? As it is said that automobile can be done after polytechnic exam what is its full process can you tell me please? In future is there any scope in automobile engineering industries? ?